How have I missed this!!??! In MechFrankenPencil I suggested the idea of a Rotring Newton type gravity selector mechanism multi-pencil but with 3 different pencils instead of different ballpoints. Now I find out they actually made it!!!! How did I miss out? I recently chanced across the Rotring Trio-Pencil on eBay and my mind boggled. 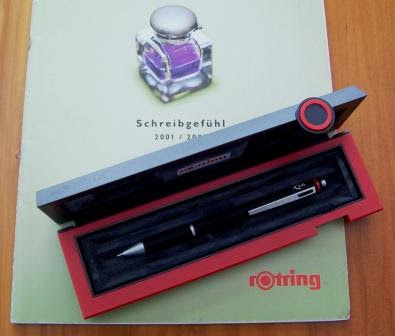 I rushed to my Rotring catalogue, or rather “Schreibgefühl 2001 / 2002 rotring” as Rotring call it. Apparently that’s a bit of marketing speak, meaning “The feeling of writing”, “That writing feeling”, “The look and feel of writing (instruments)”, well something like that anyway. LOOK, there, in the catalogue section “rotring Multipen”. Right before my very eyes for all these years! Blind, illiterate, idiot…clearly I am one or more of these. Man, this blog really does keep reminding me how little I know, and how much I don’t know. The shame of it all. Oh the Germanic precision of it. They even use commas instead of decimal points, and spaces instead of commas in their numbers, reminding me just how wrong I am. Like so much of their range, Rotring apparently stopped making the Trio-pencil quite sometime ago, but good ole eBay still has some “new old stock” available. Obviously price was irrelevant, I had to have one! Actually mine is slightly different to the picture in the catalogue, having a silver push top button rather than a black one like the catalogue. The card box that the plastic presentation case comes in states “Sanford rotring GmbH” so it dates after 1998 when Sanford took over Rotring. It also has the old Rotring website on it, “rotring.com”. That’s long since gone. The current Newell Rubbermaid (Sanford) website doesn’t even list the Rotring brand anymore, just Papermate, Parker and Waterman of their “pencil” companies. I’m fairly sure that the website did list Rotring a year or so ago, when I last looked, so who knows what’s going on. Printed on the body is 0.35, 0.5 and 0.7. Just like the Newton, there is a gravity selector system, so whichever size is held upright is the tip that comes out when you push the top button down. 10 clicks of the push top ratchet lead advance mechanisms extends 6mm of lead, irrespective of lead diameter. You retract the pencil tip by pushing down the small lever that sticks up in the pocket clip. The spring loaded mechanism then retracts the tip back up inside the body. There is a small eraser under the top cap. Leads are refilled by unscrewing the body to get to the three pencil units. The grip section is a slightly wider diameter than the rest of the body. Dimensions – Length 138mm, 10mm diameter body. This has got absolutely nothing to do with pencils, but just for now, it’s something I’d like to say. Today is a public holiday, ANZAC Day. It is an important day to me, it’s the “Remembrance” day here in New Zealand, and in Australia too, when we remember those who served their country in times of conflict. It’s easy to be bombarded with negative stories about the state of the world, so just for today I’d like to present a more positive image, of nations putting aside their differences, putting their history behind them, moving on and getting along. In World War One, the ANZACs (Australia & New Zealand Army Corps) participated in the Gallipoli campaign. That was the seaborne invasion of Turkey (the then Ottoman Empire) by British Empire and French forces on this day, April 25, back in 1915. In the fighting that followed, there were many hundreds of thousands of casualties. On the Turkish side this was in the successful defence of their homeland, and on the Allied side it was ultimately for nought, as the invasion failed and they were evacuated from Turkey. 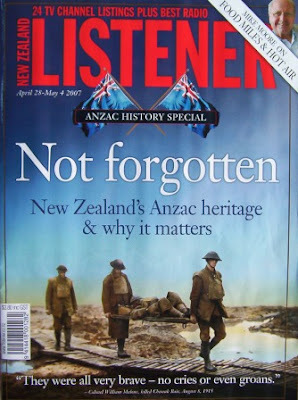 The campaign is a seminal event in Australian and New Zealand history, often regarded as our “coming of age” as nations, rather than as just colonies of the British Empire. In today’s geopolitical situation it would be easy to portray the ANZACs as just another bunch of Western Christian crusaders, quite literally sailing half-way around the world to attack an Islamic nation. Instead, in a very gracious stance by the government and people of Turkey, we, the defeated ANZAC invaders, are allowed to commemorate our war dead on Turkish soil. Every year, tens of thousands of Australians and New Zealanders visit Gallipoli, with many thousands attending the ceremonies at Gallipoli in Turkey on ANZAC day itself. Australian and New Zealand government and military personnel attend, sometimes up to the Prime Ministers and Chiefs of Defence Staff, along with Australian and NZ warships and soldiers. All this, in the country that we invaded. As much as I would like to, I sometimes struggle to imagine us New Zealanders being so generous if the positions were reversed. Irrespective of whatever allegations some level at Turkey regarding human rights and their treatment of ethnic minorities, surely here is a lesson in tolerance and reconciliation for us all. Erasers come in a huge variety of sizes, shapes, colours, smells, and a few of them, like the Uni Auto Eraser come in “mechanical pencil” or “stick eraser” format. The Uni Auto Eraser, model EH-100P, is made in Japan by Mitsubishi Pencil Company Ltd. Essentially it is a basic push top ratchet mechanical “pencil” that propels a 5mm diameter eraser rather than a piece of pencil lead. The mechanism really does feel and sound quite like an ordinary mechanical pencil mechanism. Aesthetically it’s nothing fancy, just a plain simple round black lightweight plastic body. It’s not unattractive, just a no-frills, no-nonsense sort of look. There are some shallow indent dots at the tip to make a grip zone, and the pocket clip is better than many such integrally moulded clips. The end cap comes off to refill the eraser stick, and it only holds one length of eraser at a time, there are no spares stored inside the body. Eraser refills are seemingly easily available. From my engineering and general office user background, I’ve traditionally mostly used medium and harder grades of lead, in the B to 2H sort of range. With these grades the Uni erasing power is adequate, but not exceptional. 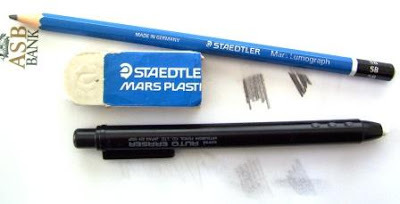 It doesn’t smear the pencil marks, but doesn’t quite seem to erase them as completely as some other erasers do, for example my trusty Staedtler Mars Plastic 526 50. It doesn’t state anywhere what the Uni eraser compound is, but I think it’s vinyl. It is a little crumbly when used, so you tend to end up with a bit of eraser waste spread around your page - it doesn’t easily twist up into a few long strands like the Mars Plastic does. On the other hand, being a 5mm core, it is suited to finer erasing work and you can maintain a reasonably sharp edge for more precise erasing. Now, moving onto softer darker leads, like 2B and 5B, things tend to change a bit. The slight crumbling and thinner erasing face do a bit better than the much larger and firmer Staedtler Mars Plastic. There isn’t as much smearing as with the Mars Plastic, and overall Uni ends up erasing more of the graphite from the paper. Best Points – The mechanical pencil look and feel, “pocketability”, and suited to finer erasing. Not so good points – The eraser compound is a bit messy for general office work. Dimensions – Length 128mm, 10mm diameter body. Eraser stick – 5mm diameter x 90mm length, of which about 80mm is usable. Footnote: You might have noticed that this posting is just called “Uni Auto Eraser EH-100P”, not “Uni Auto Eraser EH-100P Review”. I’ve got a bit of an eraser thing going at the moment and I know I’m going to end up doing a few eraser posts, but I’m quickly coming to realise there is a little more to erasers than meets the eye, (like that crumbling can be good), and that really I don’t know much about erasers, so I’ll just post some thoughts, pictures, information, etc and not be all “formal and reviewy”. Actually there’ll also be some pencil posts in this “informal and non-reviewy” manner too. Following on from Cultural Heritage. 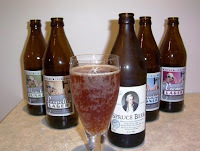 I have drunk Captain Cooks Spruce Beer, my national beverage? Unfortunately I missed the April 2 anniversary of my cultural heritage, but I did at least order the beer on April 2 after discovering that a small 2-person micro-brewery made Cooks “Spruce” beer. Actually, they make a modified recipe, as apparently the original recipe is “undrinkable” by todays standards, it being a bit of a cross between thin soup and beer. So, what was it like? Standard amber colour, very cloudy liquid, very little head, and the taste….well lets just say its “unique”. The vegetative additions of “spruce” and “tea tree” are clearly evident. Beer made from swamp water is probably the best description. But you know, if, like Cook and his crew, you regard it as a “health tonic”, then its perfectly drinkable. Suspending the rum ration for three days of beer drinking was just a happy side-benefit of this health-tonic! A lot better than drinking water from a barrel that first you had to skim the scum off the top, and then strain out the yard long ropes of algae. 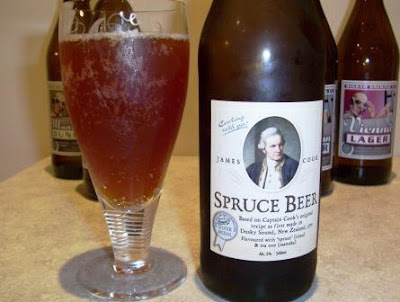 I recall Cook writing that the first sips of this spruce beer were “terrible astringent” and that the beer was then sweetened with “moleasses”. That is still evident, there’s a hint of something mouth-shattering underlying this modern recipe. I can imagine the first taste of their unsweetened brew must have been a real slap in the face. But again, they regarded such bracing acidic tastes as evidence of health giving properties. These were serious hard men, used to eating and drinking some shocking muck. No matter what it tastes like to me, this healthy swamp water beer tasted like “Nectar of the Gods” to them. 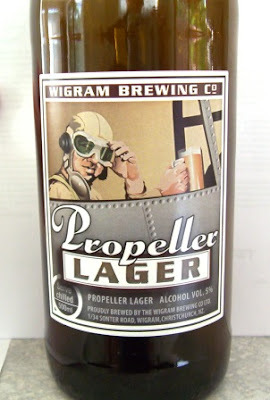 In Cooks own words, “Beer was exceeding palatable and esteemed by everyone on board”. I’m sure an annual April 2nd dose of tonic for me will keep me happy healthy and wise. Yes, yes, I know this isn’t pencil stuff, but just indulge me. Another fine liquid from said micro-brewery. Well a little bit of housekeeping. I’ve made a few additions to the Links on the sidebar over the last few weeks, so if you are like me, and forget about checking for new links on blogs that you read regularly, then you might like to take a fresh look. I guess in particular you could look at the one called “Online Retailers”, it’s been a long time coming, but finally the scales tipped over onto the “OK I’ll post something” side, so I did. Maybe I’ll live to regret it, time will tell. Here’s a few other blogs you might want to take a quick squiz at. A few mechanical pencils over in Australia. "The Dark Side" and "Beauty 2"
But, moving right along, I took out a couple of Nippy No. 3’s to use as my pencil of the week and to review. Firstly No. 3 is a rather small and dainty mechanical pencil, actually a bit too short for my personal preference. Counteracting that though, it is a very well balanced pencil. The balance point is quite high up so being top heavy suits the way it sort of fits in your hand with nothing much sticking out past your hand. I also like the long tapering tip section, they always somehow feel good in my hand. I’ve ended up with a few Conway Stewart Nippy No. 3’s, all green or blue marble with black veins. As I’ve said before, they look really great. Deep lustrous colours that come from way down inside the plastic. Beautiful gold plated metal trims. Fantastic! Most of my co-workers don’t really know about my “pencil-habit”, but the Nippy produced a few comments, “Wow, that’s a fancy looking little pen”(sic). The lights at my work really seemed to accentuate the marbling effect, I just wish my photos could do them justice. Like many old pencils of 1960’s vintage, the Nippy uses 1.18mm lead, and has a twist/screw mechanism. You wind the little black top cap around to advance or retract the lead. The term from back then was a propel-repel-expel mechanism. The mechanisms aren’t without their problems. It appears that some of these old mechanisms can be a little worn and the lead can slowly retract back into the tip under writing pressure. This can be a pain if your pencil is prone to doing this. In the perfect world, there would also be a choice of lead diameters too. 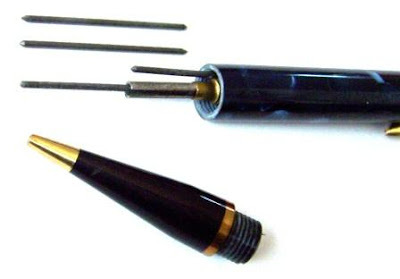 Again like many other vintage pencils, spare leads are stored inside the pencil body. The leads are only short lengths. Inserting a new lead is via the tip, all a bit complicated compared to todays “keep on clicking” easy refill magazine mechanisms. There is no eraser. The pocket clip is solid metal, not spring loaded, with heavy gold plating. It’s strong, almost too strong. When you wind the lead back inside the tip the pencil becomes semi-pocket safe as the tip isn’t all that thin or sharp. Being a fairly short and thin pencil it could suit being carried in a pocket, purse, notebook compendium, etc. Best Points – the looks, and small size if you are after a small pencil. Not So Good Points – no choice of lead size, no eraser. 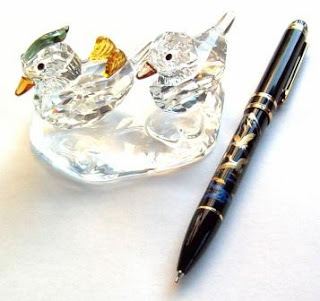 Price Range – Low to medium for a reasonable condition used pencil. Dimensions – Length 114mm, diameter 9mm. Balance point about 70mm up from the tip. Oh dear, here I go again, off on another mad tangent. Somehow, way down deep inside, I know I’m going to regret this lead advance measurement thing, but in a couple of my reviews I have made a comment about the lead advance mechanism only advancing a short length of lead for each activation. I knew of course that eventually it would get the better of me and I would have to start investigating and measuring this. Well it happened. In a moment of weakness I grabbed all the mechanical pencils on my desk at home and started clicking away. Here’s the results. Now this was only a quick rough test, measured with a plastic ruler, etc so it’s not terribly exact, but it shows some clear interesting differences. I’m trying to resist taking this further. The Pentel Flex Fit II is one of those mechanical pencils that I inherently don’t like. It’s that big ugly bulbous rubber grip thing. Yuck! 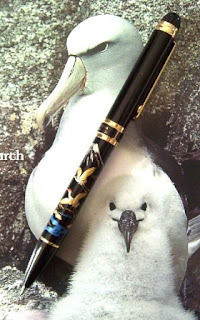 But it’s a Pentel, so I feel obliged to own one and to put my prejudices aside and try to give it a fair go. Well lets get my prejudices out of the way first. I mean aesthetically there’s the big grip thing, and it’s a rubber grip thing, then there’s the barcode printed straight on the body, the monstrous clear angular document clip, the whole thing is just yuck, yuck, blah! (That’s an official technical reviewing term.) But, they have also tried to do “something”, with the spiralling silver swirl pattern printed on the body to tie in with the twisting flex fit grip. OK, lets not dwell on it, move on. This is actually a vanishing point type pencil, like the Pentel Graphgear 1000 or the Pilot Vanishing Point mechanical pencils. You press down on the top of the document clip and the spring loaded system retracts the tip section back up inside the body for travel and pocket safety. Being a document clip rather than just a pocket clip means you can get quite a thick stack of paper under the clip. You simply push down on the top cap to extend out the writing tip. It is quite a good positive action. The tip actually seems quite rigid and fixed when extended out, surprisingly more so than the aforementioned much more expensive Graphgear 1000 and Vanishing Point. Being a vanishing point type pencil, the Flex Fit II is obviously a push top ratchet lead advance mechanism. My pencil is the 0.5mm version. There is only a relatively short lead advance per click. I suppose at some stage I will have to start objectively measuring lead advances – how many clicks to get 10mm of lead out or something like that. Returning the lead into the sleeve is a little tricky. You push down and hold the top cap like normal, but the lead is still held quite firmly and you have to give it more of a push than normal to slide the lead back up inside the sleeve. The lead sleeve has a very short straight length at its end, but it’s clearly a writing sleeve, not suitable for draughting. There is a small eraser under the top cap, about 4mm diameter x 21mm long. You could probably get about 60% effective usage out of the length. Pentel advertise the Flex Fit II as having their “Lead Maximiser” technology. They claim it means fewer jams and less lead breakage. There is no mention of actually using more of the length of the stick of lead, which is what the terminology “Lead Maximiser” implied to me. In fact, it only utilises about ¾ of a standard 60mm stick of lead, basically the same as most other pencil mechanisms. I can’t really comment on “fewer jams and less breakage” because I don’t really have any problems with jams or breakage when using Pentel pencils and good quality leads. To be honest this all smells of marketing hoo-ha to me. Fixing a non-existent problem. Finally then, the main event, the ‘Flex Fit’ grip. Arrrgggh. Sorry, just had to say that to release some pent up feelings about it. So, it looks shocking. A huge big white semi-transparent lump of some silicon sort of stuff. It is about 16mm in diameter and has 3 long depressions in it, running lengthwise from top to bottom, which sort of turn into a triangular shaped grip. There are also some tiny little slightly raised dots inside the depressions. The actual material itself of the grip is not particularly “grippy”, in fact it was almost a little slippery at first but this did change with use. It does have a little “give” to it, so it feels slightly soft, and the roughened surface effects give some added grip. All this isn’t especially inspiring, but it gets better. You can twist the lower end of the grip, with the top staying fixed, so you are spiralling the depressions around the barrel. Somewhat to my surprise, this actually works, and things suddenly get a whole lot better. You can twist the grip to the left or right, and being able to customise the amount of twist really does make a significant difference to how it feels in the hand. Personally I found a small twist to the right suited me best - maybe 15 degrees, note the non-alignment of the red lines in the photo of the grip. This meant the depressions basically lined up with my fingers as a right handed writer. Bizarrely a slightly lesser twist to the left was also fairly suitable! OK, I’m just not a fan of rubber grips, and of big bulbous grips either, so I’m never going to rave over something like the Flex Fit II, but I’ve got to admit this customisable idea is certainly one worth bringing to market, and I’m sure many will find it eminently suitable for them. If I was forced to use a pencil with a rubber grip, then at the moment, I’d choose this one. That’s pretty high praise, coming from me. Best Points – the customisable flex fit grip. Not So Good Points – the looks. Dimensions – Length 146mm, diameter 16mm at grip section, 10mm at main body. Balance point about 65mm up from the tip. Just for the record, and to be precise, I believe the proper designation would be Platinum Maki-e “Crane” Double Action Pen MWB-5000RM black + red ballpoint/0.5 pencil. What is “Maki-e”? Well I’ve seen the term used quite a lot in reference to those fountain pens that are beautifully decorated in a Japanese or Oriental style. A quick bit of online browsing informs me that maki-e means “sprinkled picture” in Japanese and it is a method of decorating lacquerware with gold, silver and other powders. Originally of course the lacquer was real tree sap lacquer, the gold was real gold, and so on. Naturally if you have a few extra dollars burning a hole in your pocket you can buy “real” maki-e, but the rest of us generally get modern versions made with modern materials, modern manufacturing processes, etc which combine to produce a price more affordable to the average pencil collector like myself. Platinum are a Japanese manufacturer of writing instruments. You can pay hundreds or thousands of dollars for their top of the range Maki-e fountain pens, or, like me, much more modest prices for their everyday pen and pencil ranges. So, what does my maki-e “crane” multi pen look like. Well firstly this model was made in a number of bird related scene variants, e.g. Phoenix, Crane. The body is a shiney black lacquer resin with a very detailed beautiful scene of two cranes flying, with river and mountain scenery completing the picture. Very nice indeed. This artwork is slightly raised on the surface so it feels like an appliqué over the top of the base surface. For the price I paid, I don’t imagine this is fancy high grade real traditional tree sap and gold powder hand made maki-e, rather it’s the modern, automated version. I’ve got no idea about the durability of the finish. Will it wear quickly with use? But I’ll be honest and say, assuming this is the “cheap” maki-e, then the real stuff must be utterly fantastic! The grip on this pencil is fairly good for something without any special grip enhancements. The resin body is smooth and shiny but the material is not slippery. It’s also about average weight for a multi pen, balanced fairly neutral, but a little towards the top. The pocket clip is quite strong, but easily usable. The gold trims are not particularly golden, perhaps a rather low gold content in the alloy? Writing tip selection is achieved by a twist mechanism. You twist the top half of the pencil to extend the tip. It is marked “M <> B” on the centre band so you know which way to twist to get which tip. The ballpoints are very fine tips and they write well. The red ballpoint is coloured red on its tip for easy identification, but the black one is just plain metal. If you extend the pencil tip, then the lead advance is activated by a normal push top ratchet mechanism. Mine is 0.5mm lead. It is rather stiff and not “precise” feeling, but that seems to be common to many multi-pen pencil mechanisms. Actually, activating it is a bit of a pain. The lead sleeve is a short sleeve, obviously for general writing purposes. Equally obviously it retracts for pocket safety. The instruction leaflet is in Japanese, but the diagrams are clearly understandable. However, there is no diagram for the multi-pen! Fountain pen, mechanical pencil, rollerball and so on, but not the multi pen. This really annoys me, because multi pens need proper instructions on how to disassemble them for refilling , etc. It’s certainly possible to ruin them if you don’t know what you are doing. 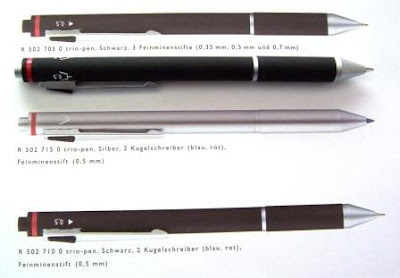 I have figured this Platinum one out by experience with other brands and by looking at the diagrams for the other pen modes, but still, it really is second rate not to include the instructions. There is a small eraser under the top cap. You unscrew the cap to get at it, so its certainly not quick and easy access! I only discovered this eraser by inquisitive investigation. 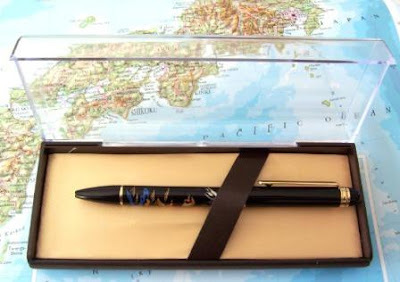 This multi pen comes in a plastic presentation box – nice enough, but plain and forgettable really. Best Points – It looks great. Not So Good Points – Poor instructions, slightly annoying lead advance. Dimensions – Length 149mm, diameter 9mm. Balance point about 85mm up from the tip. Footnote: To be honest, I ordered a black ballpoint/0.7mm twin combination, but received black + red ballpoint/0.5mm triple combination. Ahhh, the vagaries of online shopping! It really is a lottery, you order "X", then cross your fingers and hope that when "Y" arrives bears some resemblence to "X" that you ordered! Photos = "Crane + Albatross & chick"and "Crane + Ducks"
Man cannot live by pencil alone. There is also beer! One thing about living in the last country on earth to be discovered and colonised by humans is that you know the dates for a few interesting “firsts”. Today is the anniversary of beer in New Zealand. On this day, 2 April, back in 1773, the renowned explorer Captain James Cook (Royal Navy), and his crew drank the first beer ever brewed in New Zealand. It was “spruce” (rimu) and “tea tree” (manuka) flavoured beer, brewed for the important health producing properties of such fine ales. After many months at sea, Cook and his crew were desperate for something decent to drink, and Cook recorded the beer as “…exceeding Palatable and esteemed by everyone on board.” So much so, that the rum ration was suspended for three days! So, join me in celebrating my national and cultural heritage - drink a fine draught, and toast the great explorers and brewers of the 18th Century. And remember, Cook and his men drank beer for their good health. PS, just for the purists, James Cook held the rank of Commander when he drank the beer in question, his promotion to the rank of Captain came later in his career.